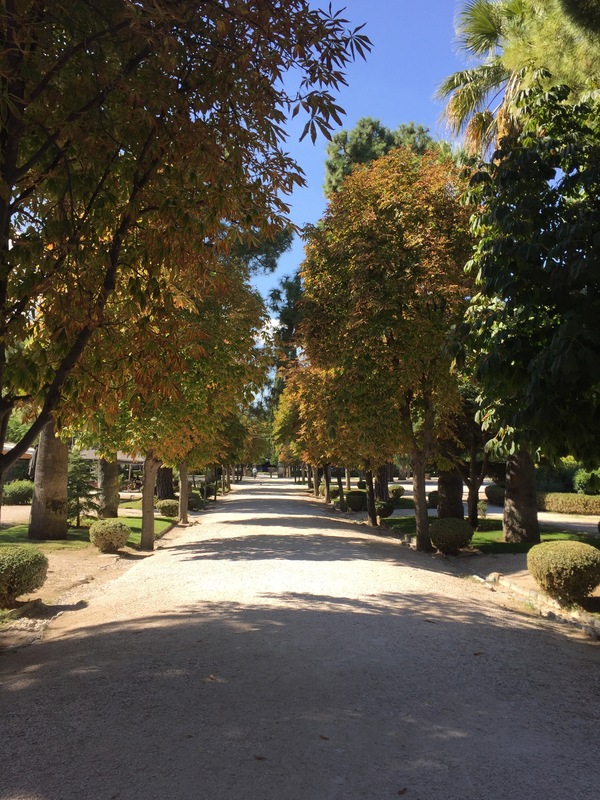 Autumn in Greece arrives surreptitiously – it creeps stealthily through September and most of October with such a gradual readjustment of temperature and sunlight that summer feels almost endless. Spending this time in the southern Aegean we have been truly spoilt – swimming in warm seas well into the second week of this month – but our time is up and home beckons. The flight from Kos to Athens takes only forty minutes but it seems to have transported us, not only from island to city, but from summer to autumn too. We land in rain and our lightweight island clothes seem incongruous; our Athenian friends are wearing coats. We change and bring out the jackets that we last wore in England four weeks before. There is another season in the air and it is not entirely expected or welcome. The next morning though comes with golden light and balmy warmth – the rain has gone , the sun is shining and our summer clothes again feel right. This is a perfect Athenian Sunday, a day for meeting friends for lunch, for walking and talking. A walk round Pláka is suggested and there can be no better day for such a thing. We meet in Monastiráki Square and it seems that all of life is here. There are fruit sellers, with barrows full of grapes and figs and even the first clementines; balloon sellers, beggars and buskers; the old, the young, those who know where they’re going and others studying street maps. Above it all, of course, is the Parthenon. Pláka is one of the ‘must see’ places for most visitors to Athens; with its narrow streets and nineteenth century, neo-classical buildings it gives us a glimpse of an older version of the city. It has though been a victim of its own popularity and in the days of high summer the streets are busy with tourists. For me there are too many shops selling the ubiquitous souvenirs and too many waiters calling out for you to sit at their tables. 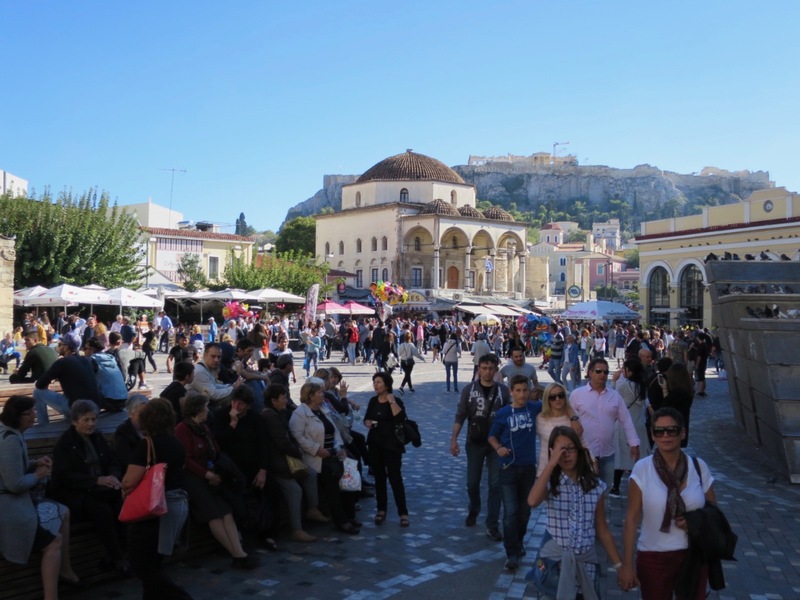 But on a sunny, Sunday in October, with the streets a little quieter, this is the perfect time to see the place; even so we leave the shops and tavernas behind and make our way up the hill of the Acropolis. There can be no greater delight than finding something new in a place that you think you know well. There is an obvious pleasure in revisiting favourite haunts but finding new ones is truly gratifying. 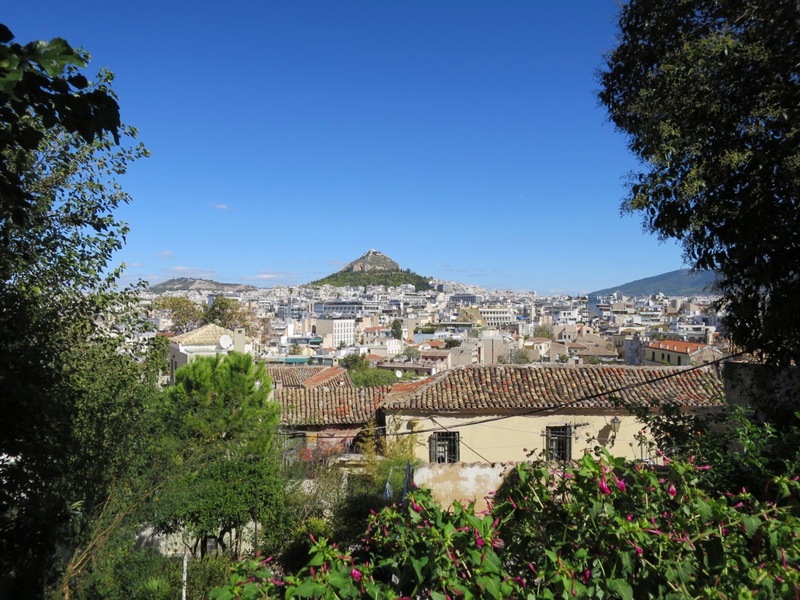 On the foothills of the Acropolis of Athens, on that bright Sunday in mid-October I came across my new favourite place in this city – Anafiótika. The story goes that in the early 1830’s, when Athens became the capital of the brand new nation of Greece, builders and stone masons were brought in from the tiny Cycladic island of Anáfi. These Anáfiot craftsmen set to work building the palace for the Bavarian prince, Otto, who had been shipped in to rule the Hellenes. In the daytime the builders worked at the palace, but in the evenings they built homes for themselves. Of course, they built homes that reminded them of those left behind on their little island, so many miles away. 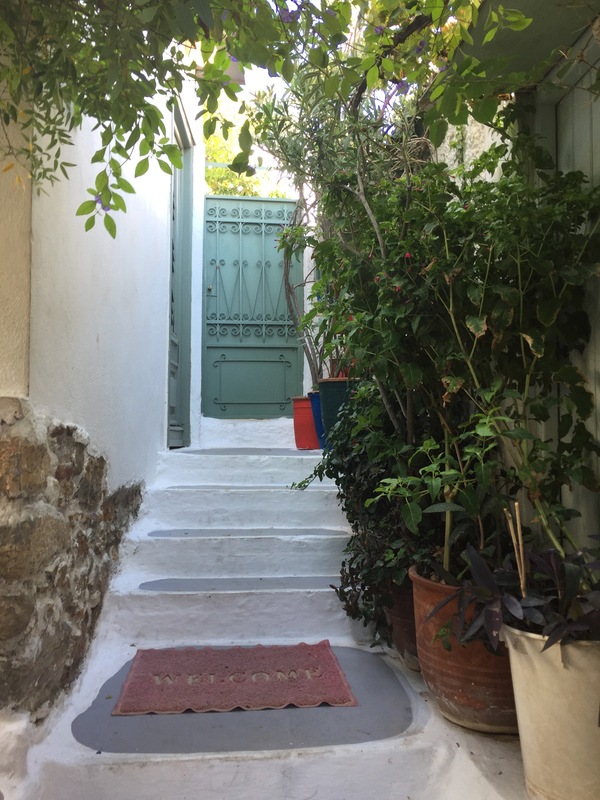 So that is how, just a ten minute walk away from the busiest, most urban parts of Athens, you find yourself in a little ‘island’, amongst pretty whitewashed houses with brightly coloured shutters. 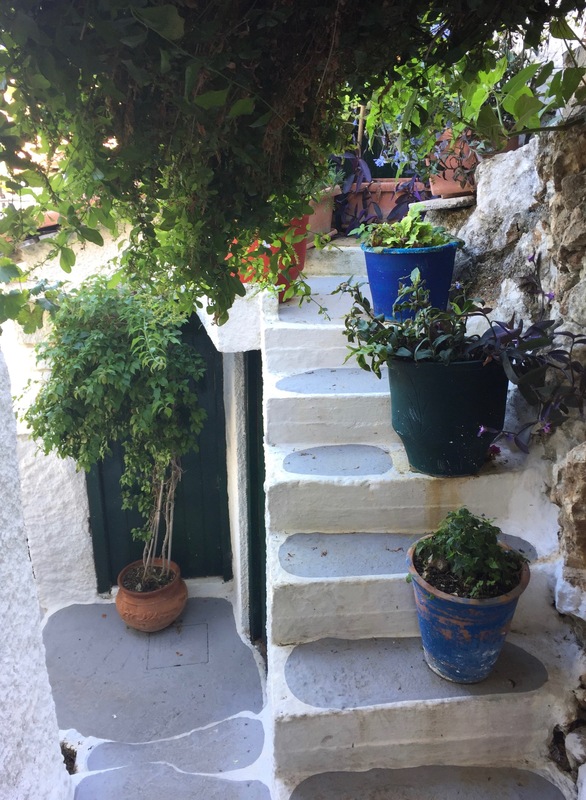 Ambling along these meandering lanes, overhung with bougainvillea and jasmine, it is hard to believe that you are not far away from the city, on an island in the Aegean. It is charming, genuine and peaceful; a true oasis in the metropolis. We go for lunch back down in Monastiráki Square, the venue is one of the homes of the kebab, ‘Sávvas’. It is a shame that for the British, kebabs have become synonymous with the conclusion to boozie night out. In Greece ‘souvláki’, real Greek kebabs that is, are a delicacy in their own right. Of course, you can have some pretty grim ones – just like fish and chips in England, quality is everything. There are innumerable souvláki restaurants around Monastiráki and, a bit like football teams, each one has its followers and people are incredibly loyal. You either have your souvláki at Bairaktíris, or Sávvas or Thanásis – we are usually in the Thanásis camp. Today we are overruled – we are supping with the enemy it seems, so Sávvas it is ! Although they have been cooking kebabs in Athens since 1922 it is only since the turn of the millennium that Savvas moved into the multi-storey premises on Ermou Street. This is truly the cathedral of the kebab. The place to be, of course, is on the top floor with its roof-top terrace and views of the Parthenon – at Sunday lunchtime it is incredibly busy. The clientele are from all classes, and are of all ages, and such is the prestige of the place, that there are even families here for celebratory meals. Forget those greasy UK kebabs served on polystyrene trays at 2am, this is ‘souvlaki’, a real dish in its own right. Even though Greeks have been cooking bits of skewered meat over charcoal for thousands of years, most of the kebab houses in Monastiráki owe a lot of their culinary tradition to the cooks that came from Asia Minor in the 1920s. They introduced different versions and mixes of meat and spices, bringing some eastern flavours to the cooking and serving of souvlaki and also the word ‘kebáp’ (κεμπάπ). Whenever ordering a kebab in Greece there are some basic things you need to know. First of all the choice will be between ‘pieces’ (komátia), small cubes of meat, or ‘mince’ (kimá), a long thin sort of burger – both will be served chargrilled. Next, you can have either type ‘wrapped’ – this means that the meat will be wrapped in a soft pita bread. By the way, real Greek pita bread bears no resemblance to the ones found in UK supermarkets. Along with the meat there will be all sorts of other things included in the wrap. If you go for ‘everything’ (ap’óla) , this will be sliced tomatoes, onions, chopped parsley, tzatzíki and even chips. The more sophisticated version (well that’s how I like of think of it) will leave out the chips. 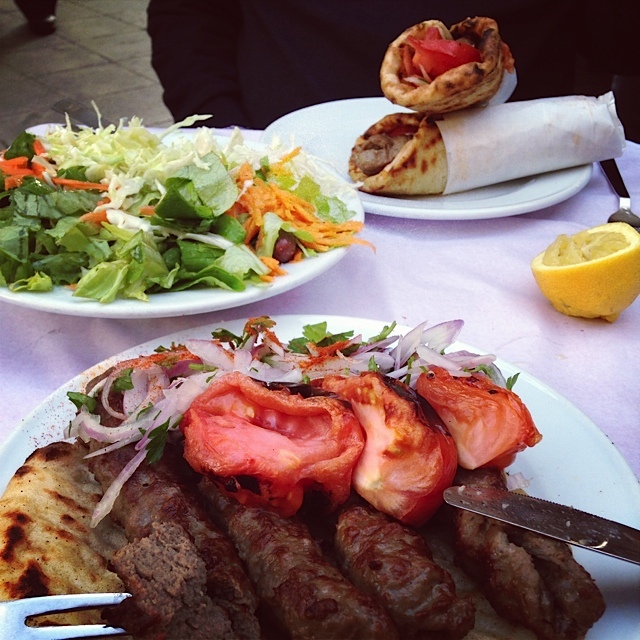 Souvlaki can also be ordered as a ‘portion’ (merída), here the meat will be served on a plate, on top of the pita and with less of the other bits and pieces. All that is just the basic souvlaki order -and at ‘Savas’ there many, many types to choose from. 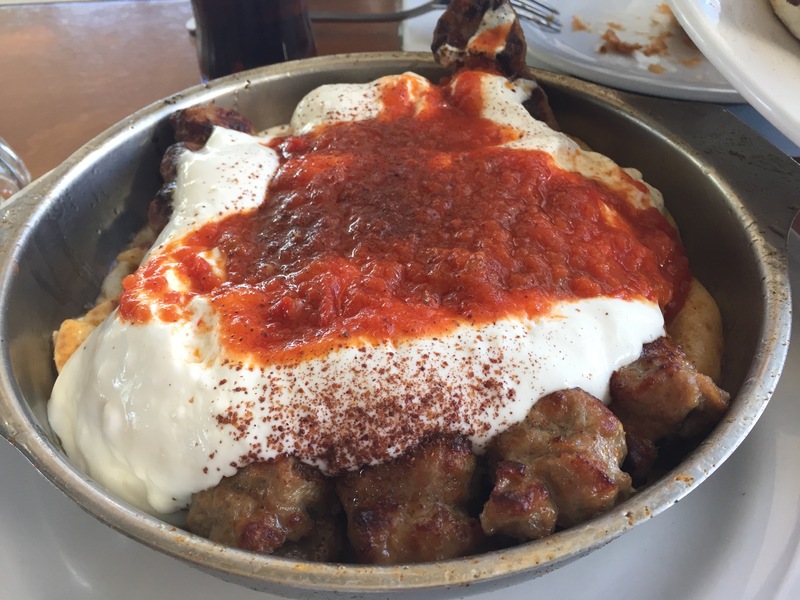 I am rather partial to ‘yaurtlú kebáp’, grilled minced meat souvlaki, served with pieces of pita bread and all topped off with yoghourt and spices. 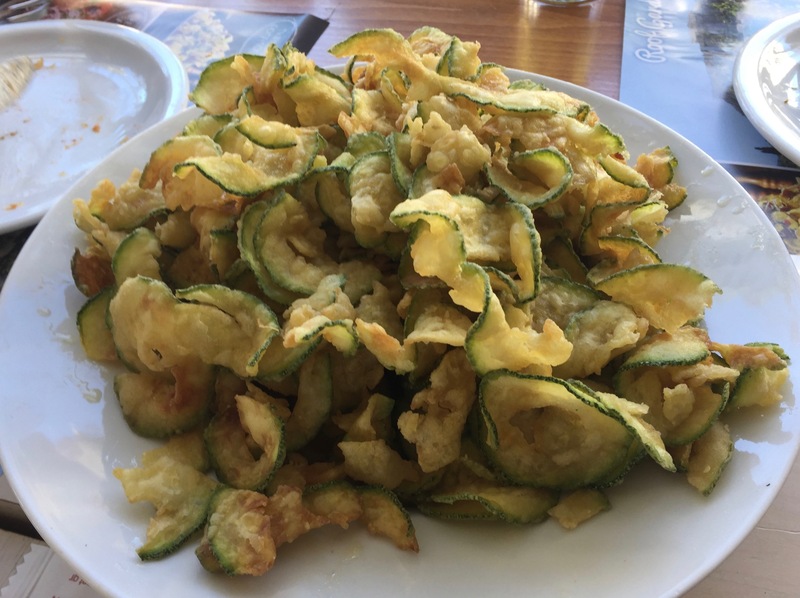 The side dish of wafer thin courgette fries was extremely good and incredibly moreish . 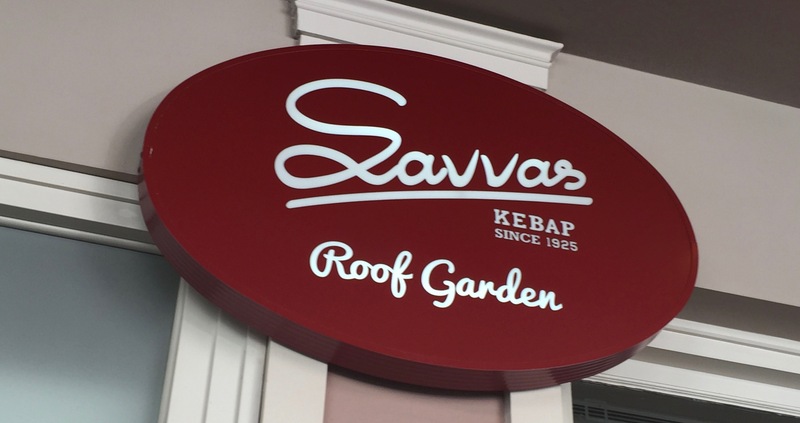 At Sávvas, as at all the most reputable kebab houses, the meat is the key, and whatever you have will be grilled to perfection. This is honest, food, cooked well, served without any pretension and enjoyed by all, regardless of class or age – a truly democratic dish in fact. It is almost pointless to try to recreate this dish at home – disappointment is almost certainly guaranteed. If you do want to have a go, this is a good mix for the mince version. 500 gm minced beef – or a 50/50 combination of minced beef and pork, or beef and lamb. Don’t go for extremely lean meat – you need a bit of fat to keep it moist. Put all the ingredients into a bowl, mix well with your hands. Shape into sausage shapes and grill or griddle cook, until cooked. Serve in pita bread with with sliced tomatoes, onions, chopped parsley and tzatziki. Previous Post Little Odysses and ‘Business’ Lunches – Nisyros and Kalymnos. Just caught up with this and it’s got my taste buds going. Thoroughly enjoyed reading it. Just avsuggestion but how about you, Craig and I, with our other halves, meeting up for a meal in a selected restaurant and a good old chin wag? Perhaps in the new year.